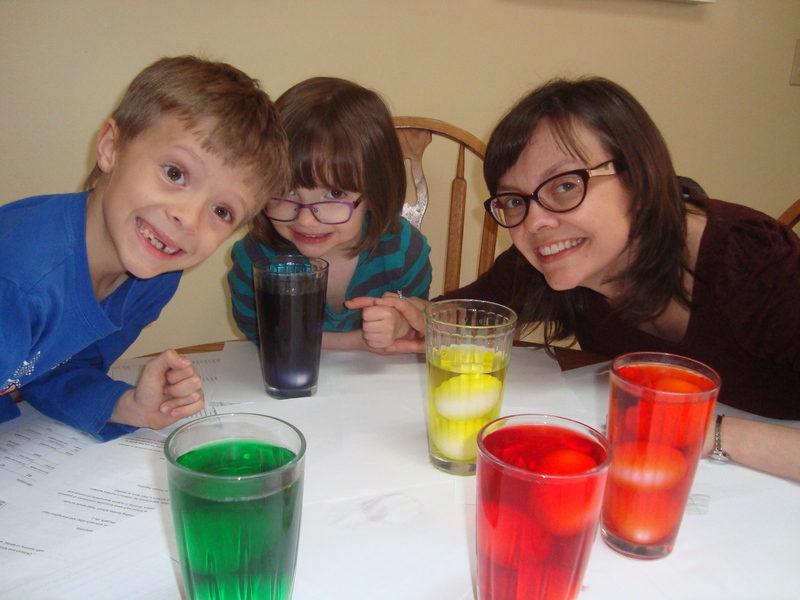 This week we dyed eggs with our children. 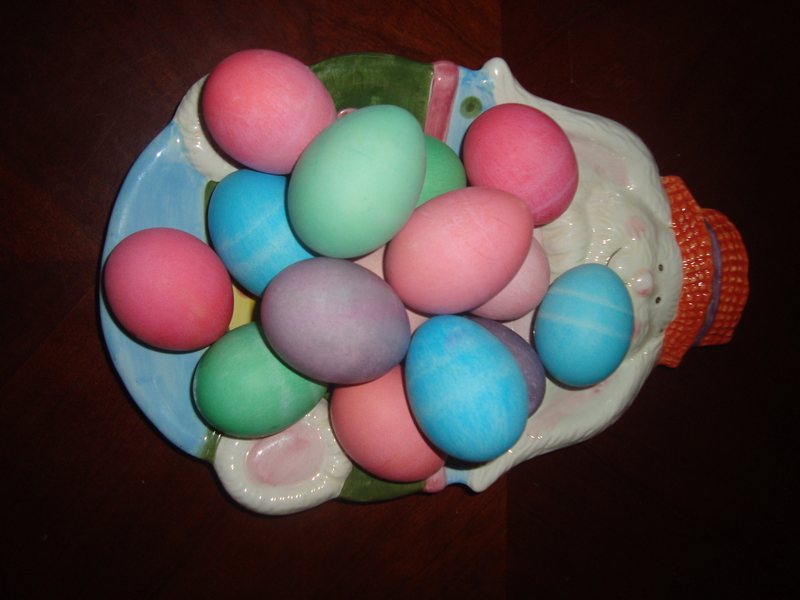 As we prepare for Easter, there is joy in creating something beautiful out of simple white eggs. A few years ago we added a fun twist to the tradition. We were celebrating Easter with our friends, the Simpsons. Diane served us devilled eggs, which she explained she made every Easter out of the eggs their family had dyed earlier in the season. I thought it was an awesome idea! As we dove into her delicious devilled eggs, though, we decided that, for Easter, “devilled” just didn’t seem like the right word. (Yes, we knew that it just referred to a style of preparing the eggs, but still…). We decided that, for us, devilled eggs would henceforth be called “Resurrection Eggs.” A new name and a new meaning. They became even more delightful!! As we live in Holy Week, there is something powerful about the imagery of taking a plain white egg and making it art, of then making that art into delicious food, and of then giving that food a new name, so that everything becomes part of a story of redemption. This is task of the Easter story – to see redemption in all things. Sometimes, however, it can be hard. It can be a challenge to see the beauty in what is otherwise ugly. As I continue to look back at the last days of my sister’s life, one of the most difficult things for me to remember is what happened to her body. Having battled skin cancer for eight years, Roxanne’s body had been through a lot. She had had many surgeries and many different growths removed. She had many scars, some of them very deep. Roxanne often tried to cover up her scars, which I understand, but I never saw those scars as something to hide. To me, they were beautiful, and I would tell her so. I didn’t see ugly. I saw survival. I saw strength. They were the symbols of my sister who was even more beautiful because of what she had been through – not in spite of it. Nearer the end, it got harder to see beauty. Friends, melanoma is ugly. It is cancer that is visible. It takes over the outside along with the inside. It is with a heavy heart that I remember the growths that kept growing all over her body, even as her body was shrinking. On her leg, there was a growth bigger than a tennis ball. It’s hard for me to think of those growths as beautiful. I don’t know what new name to give them to see them as something else. I want to call them ugly and leave it there. “…Here is your king,” Pilate said to the Jews. Only a few days ago many of these same people had shouted “Hosanna! Here is our King!” And now they yelled “Crucify!” He is criminal! What a difference it makes how we name things. Jesus had not changed. He was the same man who had entered their city to praises earlier that week. How they saw him had changed – they no longer saw him for what he truly was. They couldn’t – or wouldn’t – see His beauty. There is a time to name things for what they are. Cancer is ugly. Crucifixion is ugly. Death is ugly. And there is a time to name things for what they really are – Roxanne was not cancer. She was beautiful, inside and out, cancer and all. Jesus was not a criminal. He was – and is – King of all things. And because that is true, I look forward to the day when I will see Roxanne in her new body, even more beautiful than the one I remember on this earth. A body that will be so because of the scars of Jesus. This week, I will look at my soon-to-be “Resurrection Eggs” and remember: Because of Christ, there can always be beauty. Even in tumors. Even in cancer. Even in scars. So much depends on how we name things. I haven’t heard anyone else say they have had this problem. Hopefully it is working better for you now. (And apologies for not responding sooner as the question went to spam for some reason). Thanks for visiting!